Fast forward roughly two years and my skincare routine has been adapted to the ingredients and product type that Pamela had recommended. I’ve introduced a newbie or two but nothing too intrusive that will harm my skin. For the most part my skin has been amazing, the usual blemishes when hormones/stress kick in but other than that it’s be great. However, the past two months or so I’ve had a few things going on with my physical health so my skin has reacted to it. The texture completely changed and it became a real problem for me along with a lot more break outs. Strangely it was mostly on the left side of my face and I was researching like crazy but couldn’t come up with a solution. 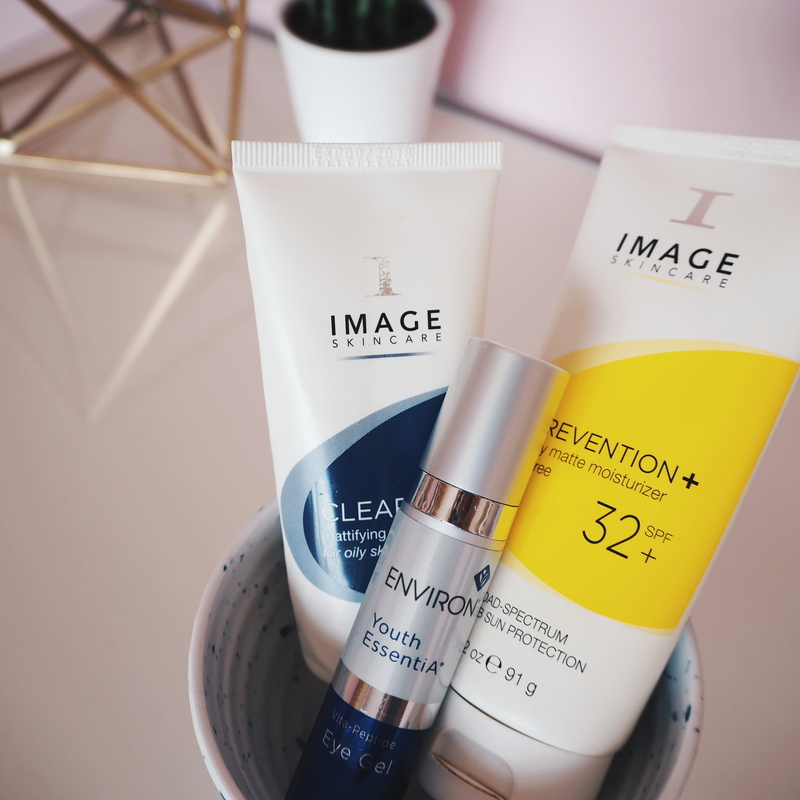 As you all know the majority of my skincare is centered around Image Skincare a very well known brand that is highly thought of in the beauty industry. Founder Janna Ronert, is an avid promoter of healthy skin and wellbeing, her products really have changed my skincare for the good. So since getting sick I wanted to invest in some new exfoliatant scrubs to help combat my recent skin/texture issues. I rotate between three products – two are exfloiants and one is a much loved cleanser. OK .. so starting with the cleanser I use the Iluma Intense Lightening product that is so beautiful on the skin. It is a sulfate free gel to milk cleanser that removes ALL makeup, dirt (in a non dirty way) and surface impurities all while brightening the skin… I cannot live without this one. When my skin is good, the cleanser is the only type of cleaning product I need for my face. It’s suitable for all skin types but focuses on uneven skin tones, dark spots and skin discoloration. I have suffered with the first two points hence why Pamela recommended this product for me. Over time my skin has balanced itself out and the dark spots are not as obvious but we still have more work to do regarding the tone of my skin. Next we have two very new exfoliatants that I’ve incorporated into my routine. 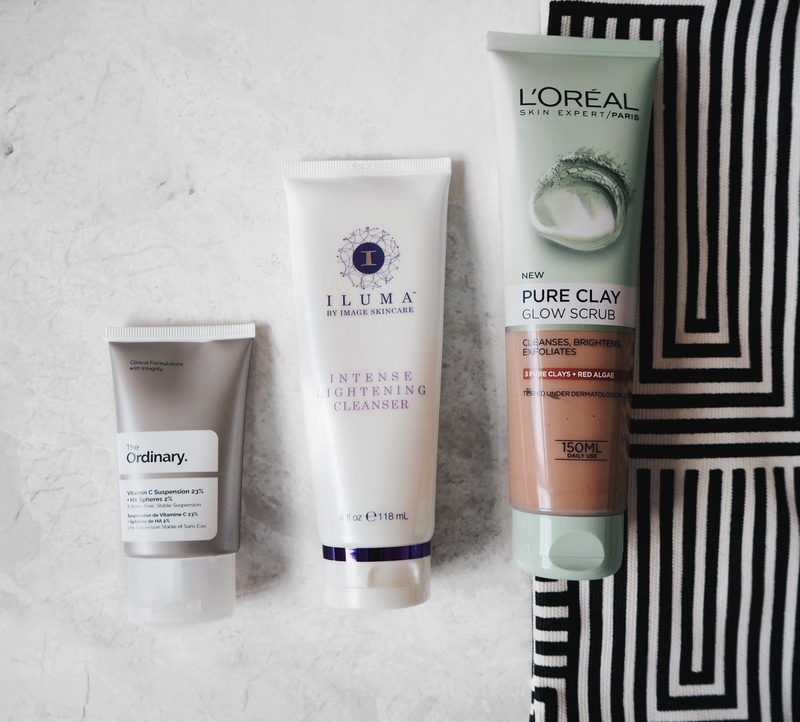 The L’Oréal Pure Clay Glow Scrub just recently launched and it’s a nice treat for my skin. I’m still trailing it so I can’t give my full seal of approval but it certainly removes any dead skin cells. I’ve never really used a daily scrub (this step can be a little harsh on my skin) so I keep this one and use it every two/three days. One scrub that I have been LOVING however is by a very quirky and hugely hyped brand, The Ordinary. It’s very effective Vitamin C Suspension cream application is a little different to the others as I apply this mixed in with my nighttime moisturiser. It’s quite a liquid formula with tiny granules (they aren’t the annoying ones that you feel all over your hands & face after application) that act as a powerful and effective antioxidant. Not only is it water, vegan, silicone and cruelty free but it has a collection of powerful ingredients such as L-Ascorbic Acid which has been shown to reverse signs of aging and brighten the skin. 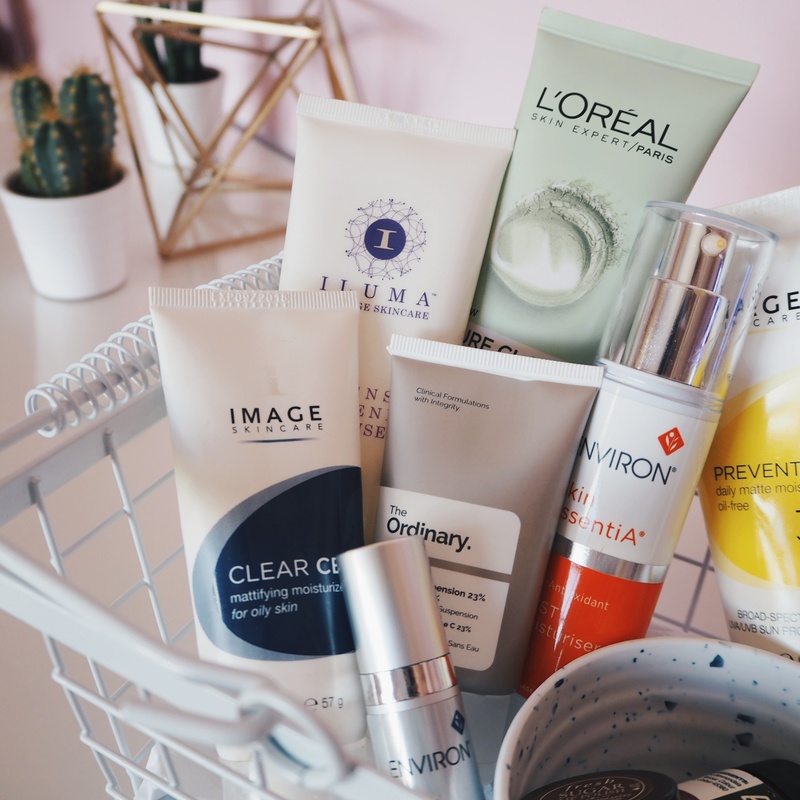 Before starting my skin journey I had such a dull and grey complexion so *a lot* of my products include brightening ingredients. I’ve noticed a MAJOR change in my skin since using this little miracle product so I would 100% recommend it – plus for £4.90 it’s an absolute bargain!!!! Once I’ve prepped my skin I start the process of calming it down and giving it some much needed hydration and TLC. Again I work with the Iluma range and their iconic Intense Lightening Serum that was the very first Image product I ever tried. I first heard about it at an event for the brand at The Mal Maison Hotel. It’s a cult product and a massive step for me between cleansing and moisturising. It clears any bacteria that might be on the skin – this isn’t uncommon as we never realise how much we touch our faces. When I first visited Pamela my face was quite red in places with discolourations and some skin inflammation. Again, this is suitable for all skin types and is designed to help promote clear skin and it certainly does do that. After treating my face to this lightweight and oil free serum, I move onto my Environ Avst Moisturiser (I use stage 1). This is part of Environ’s Skin EssentiA Vitamin Setup System and it’s a relatively new step in my routine. I’ve been using it for about eight months now as the process of moving up stages has to be monitored. Due to the various strengths you have to be careful with each level because you can damage your skin by increasing strength too soon. 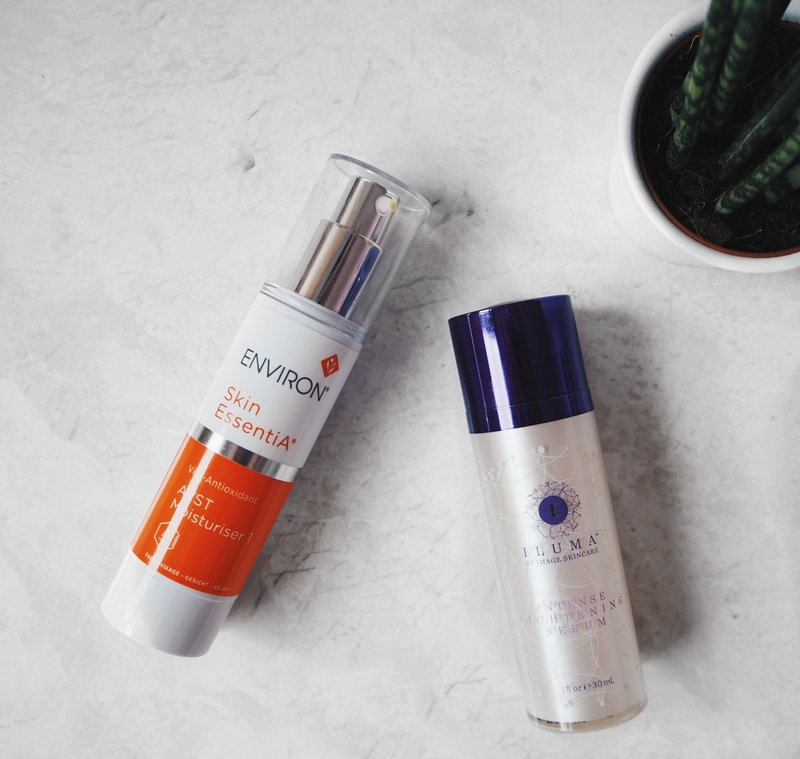 With its low concentrate of vitamin c in the form of Retinyl Palmitate as well as antioxidants, it is a very important part of my daily skincare favourites (please ignore the colour change in these two images – the contrast changed due to lighting etc). Finally, after all of the prep and cleansing I start the final steps of my routine. It’s nothing ground breaking but it involves two moisturisers – one for morning and one for evening. I included my eye cream along with them but I apply this straight after my cleansing and before any of my other products. My morning moisturiser, Prevention +, is my absolute favourite product of all time – and this is a huge statement for me to make. If I only had one item I was allowed to take with me to a desert Island, this would be it. From the glorious scent to the effective properties, I am obsessed with it. I know a lot of people who hate any type of fragrance in their skincare products but this one has never irritated my skin. It is so devine to use and has worked so many wonders on my skin. I have combination/oily skin so I prefer a matte finish as aposed to an overly hydrating one. I lock in my hydration in earlier steps and the matte just seals it all in place. In my previous visit to Rejouir, I initially had A LOT of sun damage but we worked on that and resolved a large majority of it. So for daily use, I stick with a product that protects my skin from any UVA/UVB rays (even in Winter) and corrects of any prior damage – plus it has an SPF of 32. In the evening I sometimes use Image’s Clear Cell Mattifying cream or else I’ll just stick with my Environ moisturiser. It’s a nice product but I don’t notice a massive change to my skin. 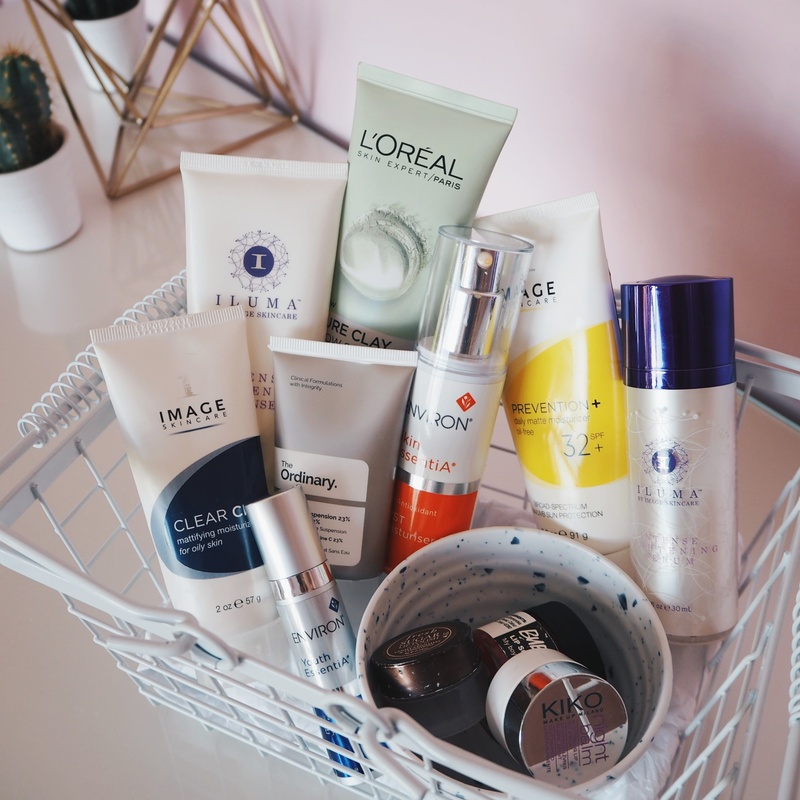 I think with the amount of amazing prep that was applied beforehand, my skin doesn’t rely on it heavily. Like I’ve previously stated, I mix my Vitamin C Suspension cream with my Environ moisturiser and that is pretty much my nighttime moisturiser. I’ll also spray some of my prep and prime hydrating mist from Urban Decay for a little more refreshment on those Winter evenings. Another area that I never fail to neglect is my lips – they’re often forgotten about in people’s routines. 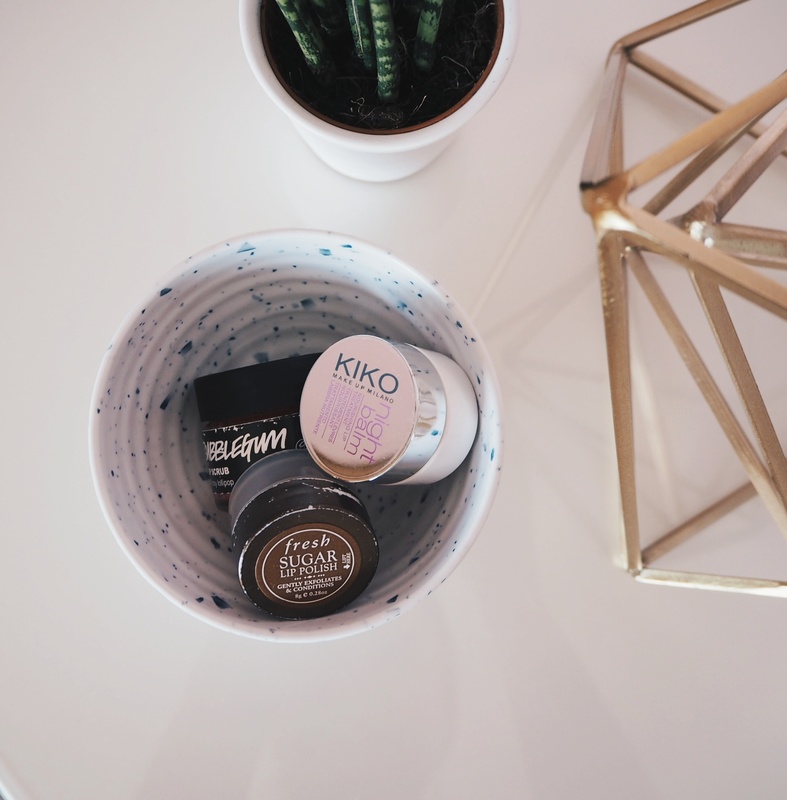 I use two lip scrubs as both have different textures. My Lush Bubblegum scrub is quite harsh in texture and really removes any chapped skin from my lips whereas the Fresh Sugar Lip Polish is much more hydrating and gentle to use straight after the bubblegum scrub. Finally I lather my lips in my KIKO Night Balm which is insanely hydrating. It’s an oil based product that locks in moisture like you wouldn’t believe. I use it everyday and night, I don’t think you need to use it only in the evening. *Please note: this was not a paid or sponsored post. Some of you may use less or more products but I feel that my routine is quite simple. Given the fact that I’ve just shared both my day and nighttime routine, I think it’s extremely manageable. 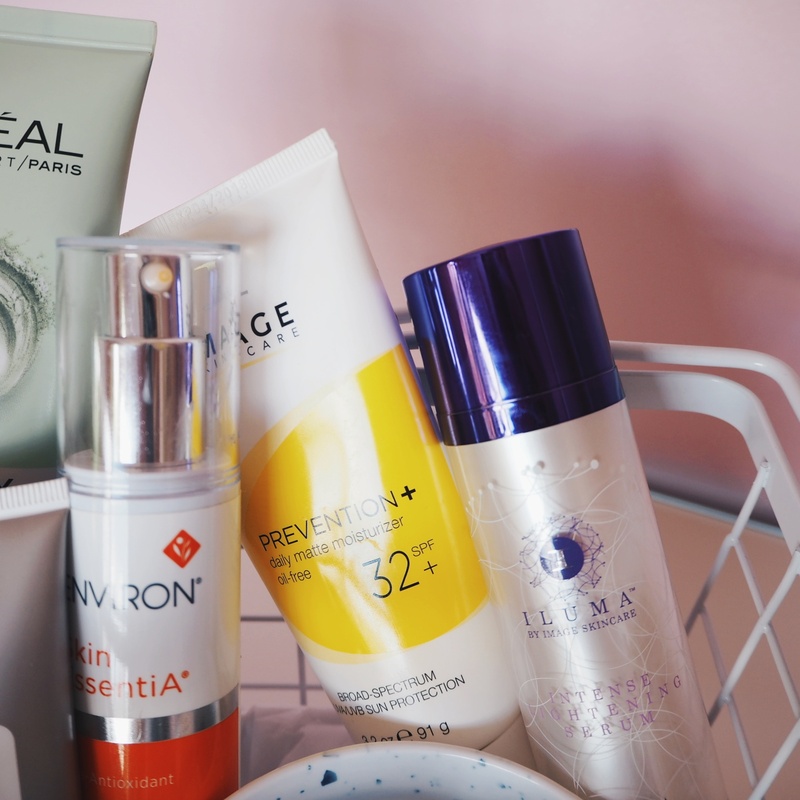 When I think back to the *many* products I used back in the day, I was destroying my skin. I didn’t have a clue as to what each products were used for but know I feel like I’ve nailed mine. P.s.. Now that I’m back and somewhat blogging weekly I’m going to aim for every Wednesday with a new post!